I don't know who first called the cheese roll "Southern Sushi" but the title works well because sushi and cheese rolls both take time and care in preparing and rolling. Describing cheese rolls as "Southern Sushi" also makes locals laugh as they immediately connect with the imagery. 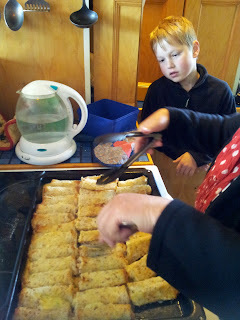 It's a hard job finding the perfect cheese roll but my Mum (affectionately known as CV) perfected the cheese roll and any major family event usually included 'chomping' cheese rolls. My sister Kerry has inherited the role of cheese roll maker for Mackay clan gatherings and in turn is teaching our youngest nephew Alex the secret of the perfect cheese roll. The cheese roll is perfectly suited as a southern comfort food with a buttery crunch outside and a hot cheesy filling that oozes when bitten into. Kerry has agreed to share the recipe and method with you all. This time Kerry added grated Mozzarella cheese. Mum would make up to around 500g of grated tasty and a smaller pack of vintage tasty to give extra bite. Kerry has made it easy by buying the pre-grated bags of cheese. 2 loaves of sandwich cut bread - ideally, the bread is lightly grained which will roll easily. 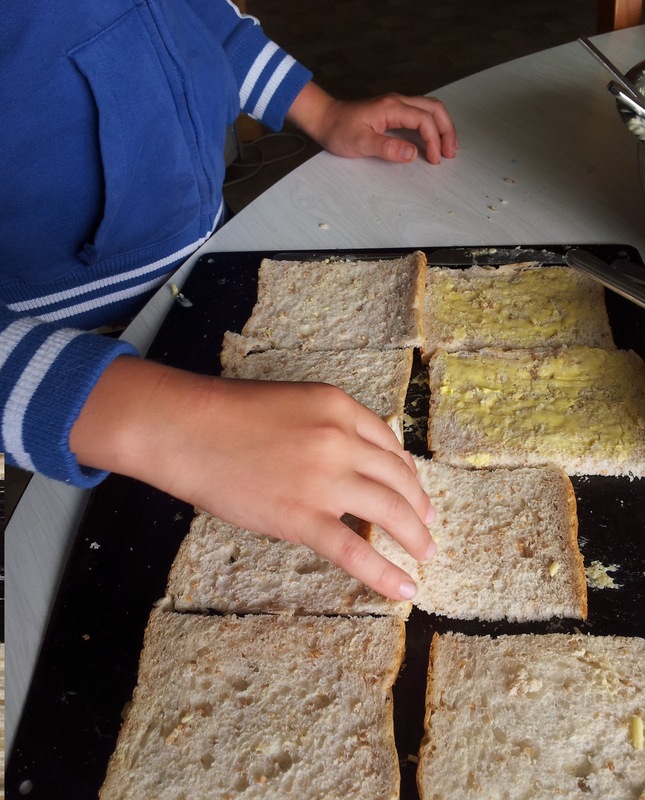 Next day cut the left and right sides of bread to assist with rolling. 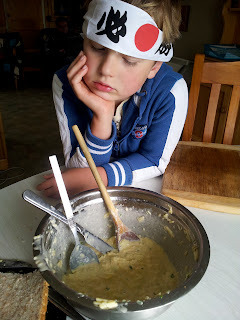 The cheese mix should be the consistency of porridge - add fresh milk if the mix is too stiff. Place on an oven tray and butter each slice. (In winter to make the rolling easier place a roasting dish of boiling water under the tray- this warms and melts the butter into the bread and makes rolling easier). Next turn over the buttered side to face down on tray surface. 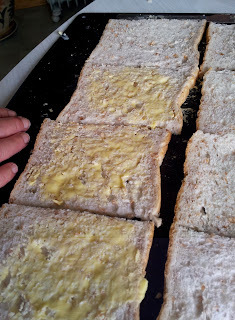 Now, spread the cheese mix onto the centre of bread making sure you leave space around the edges of the bread to allow for spread of mix once melted. Cook in a fan oven at 200C turning once to make sure each side browns. They take approx 20 minutes to cook. Kerry made the cheese rolls the day before we ate them and stored them in plastic bags in the fridge overnight. She also made some small packs to leave in the freezer for Alex to enjoy another day. They do freeze really well and can be cooked from frozen but that will take slightly longer. Anthropologist, Professor Helen Leach, from Otago University has investigated the cheese roll and it's place in history. Helen and her colleague found an amazing 140 cheese roll recipe references in Southern community cookbooks dating from the 1930's to the 1990's. I discovered 3 different recipes in a St Peters College, Gore, recipe book from the 1970's. I remember in the 60's and 70's every cafe in the South offered cheese rolls. 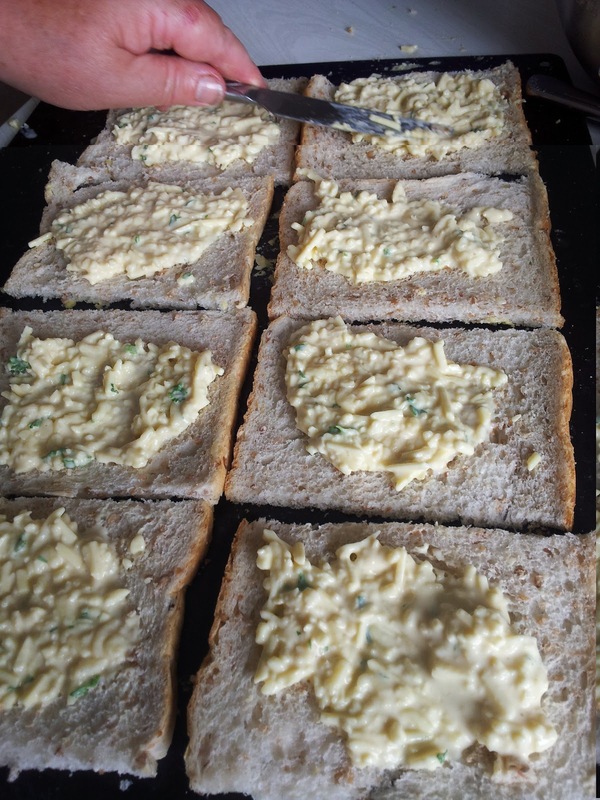 The original recipe was a pre-cooked cheese filling but the recipe we use is as Helen Leach calls it the "convenience food" recipe where the cheese mix sits for a day and then spread onto the waiting bread. This was the recipe I also followed when making hundreds of cheese rolls as a school fundraiser in the 90's - there are still plenty of southern parents making cheese rolls as a dependable fundraiser. What separates the fundraiser cheese rolls from my Mum's is the quality of cheese and the addition of some grain in the bread. The real secret is to make sure the rolls are buttered before rolling rather than buttering after cooking. 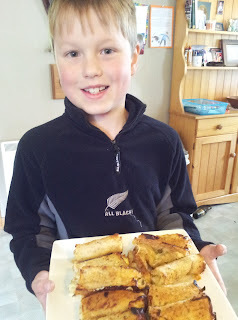 The cheese roll is only found in the South Island, and is held with affection by Southerners. 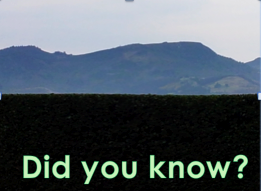 The cheese roll has never migrated north - I wonder why not?